It’s not a stretch to imagine a why people love to wear clothes with a little give in them. From the outside, stretch fabrics look almost indistinguishable from normal ones. But on the inside, they incorporate a small percentage of elastane, also known as Spandex or Lycra, which allows clothing to move effortlessly with your body. For all-day comfort, take a look at these stretch essentials that will bend and not break your budget. Whether you are an athletic guy who needs a little extra room for your biceps, or a normal Joe who needs some extra room elsewhere, stretch shirts do a much better job conforming to your body. 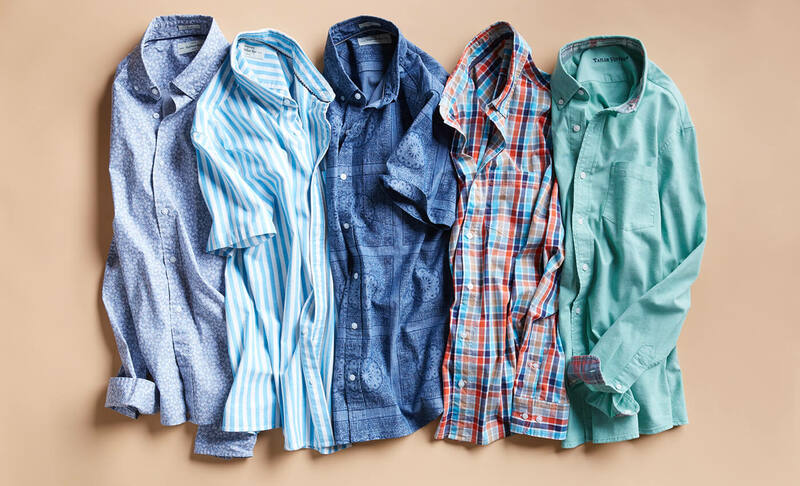 Like we mentioned before, these fabrics look just like fabrics without stretch, so you can essentially wear a stretch shirt for any occasion you normally would—from a short sleeve button down on the beach to a tucked in Oxford at work. If you’re a guy who prefers a more fitted look, this is where stretch fabric really shines. You can wear tighter clothing without having to sacrifice style for comfort. There are multiple advantages to wearing jackets and blazers with stretch. First, you won’t have to worry as much about them getting as wrinkled, which makes them ideal for traveling or packing for weekend getaways. Second, stretch jackets are notoriously more comfortable. Lastly, you can achieve a much more slimming fit by wearing stretch fabric, which will conform to your body but won’t restrict movement. If you’re the type of guy who dreads wearing a structured blazer or stiff denim jacket, your shackles have been released by the stretch gods. Let’s not forget about the bottom half of your body, which is usually doing most of the legwork. 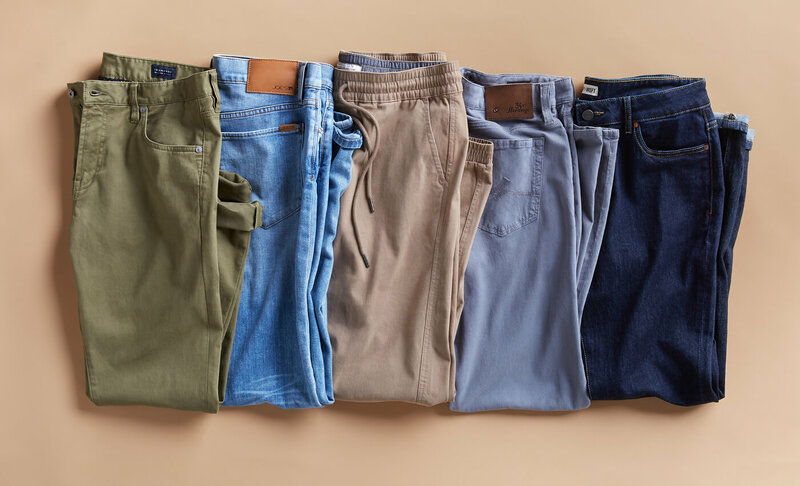 Chinos and jeans are probably the most popular item of clothing to wear with a little stretch in them. Adding stretch to denim jeans is a great way to avoid the notorious break-in period that many denim wearers suffer though. And with athleisure on the rise, you can feel confident wearing pants like joggers for an ultimate blend of day comfort and casual style. 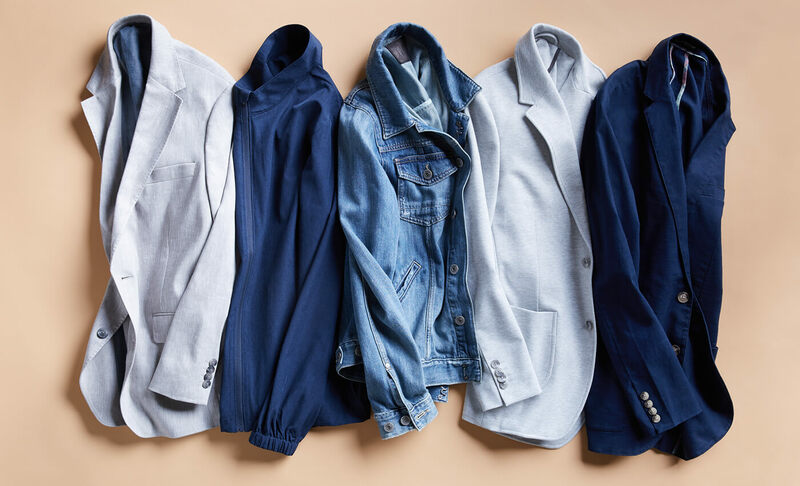 Whether you like to wear form-fitting clothes, are looking for a wrinkle-free option, or just like to be comfortable all day, it’s worth giving these stretch essentials a try.